Rambutan is another important fruit tree of humid tropics mostly confined to South East Asia especially Indonesia, Malaysia and Thailand. In the recent past, this fruit has spread to other humid parts of the world. Rambutan is an important fruit tree humid regions of the South East Asia, especially Indonesia, Malaysia and Thailand. In the recent past, this tropical fruit has spread to other humid tropical regions of the world including India. Rambutan, a medium sized evergreen tree with an open structure growing 12-15 m high, is a native of the Malaysian Indonesian region. It produces ellipsoidal fruits in clusters of long thick, soft, hairs or spines on the surface these are known as rambutan (in Malay ‘rambut’ stands for hair). The hairy outgrowth has eye catching red and yellow colors and it imparts a distinctive exotic appearance to its fruits. The thin, leathery fruit skin is easily peeled away, revealing a pearly white, gelatinous, juicy pulp (aril) surrounding a large seed. The pulp tends to be attached to the seed in some varieties. In others, it can be readily separated. The translucent pulp is sweet or sub acid with a refreshing flavour and is skin in many ways to litchi pulp. The fruits are a good source of sugars and vitamin C and are eaten as a fresh dessert fruit. The pulp can be preserved in syrup or used in several conserves. Rambutan is strictly a tropical fruit requiring a moist warm climate with a well distributed annual rainfall of at least 200 cm. The plants can grow at 10-500 m above mean sea level, but areas with dry winds are harmful for the tree growth, which leads to browning of leaf margins. In Indonesia, this fruit is distributed in areas with the altitude 30 m above sea level, with 90-150rainy days in a year and temperature 20`-30`C and relative humidity 60-82%. Rambutan trees grow best in deep, well drained soils, rich in organic matter. They can grow in heavy soils, if well drained, and in sandy soils, if these have good organic matter. A pH of 4.5-6.5 is suitable. At higher pH, iron and zinc deficiencies are common resulting in chlorosis and leaf yellowing. Since rambutan is a cross pollinated crop, large genetic variation has occurred in nature over generations and numerous varieties have been identified. But their nomenclature is confused. Most of them can be distinguished by spine length, fruit wall color, aril thickness, and aroma, adherence of aril to the seed, vitamin C content and fruit set. Rongrien and Chompu are the most popular varieties in Thailand. Both these have crisp arils and are well suited for canning and for fresh consumption. Bingjai, Lebak Bulus and Rapiah are important varieties like Azimal ( thick aril, sweet to sub acid pulp), Kelip (medium thick aril, very sweet) and Singapura ( thin aril, very sweet) are gown in Malaysia. 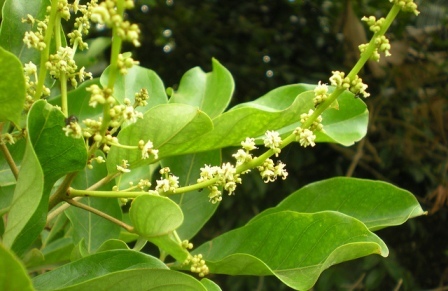 Trees with male, female and perfect flowers are known in rambutan, but most of the cultivated varieties are generally monoecicus, bearing male and female flowers on the same tree. Most of the varieties as mentioned above are of seed origin, but scientifically use of seeds for propagation is discouraged in rambutan culture for two reasons: the progeny varies with uncertain performance and occurrence of both male and female trees. The male trees not producing a crop while the female trees require pollinator to bear well. Hence, vegetative propagation is advocated to maintain the genetic integrity of a variety. For rootstock purpose, fresh seeds are planted in humus rich medium with good drainage. Seeds germinate in a fortnight. At 3-4 leaf stage, the seedlings are transplanted to polybags with minimum possible damage to roots. The seedlings are ready to bud when the stem has attained a diameter of about 15mm. 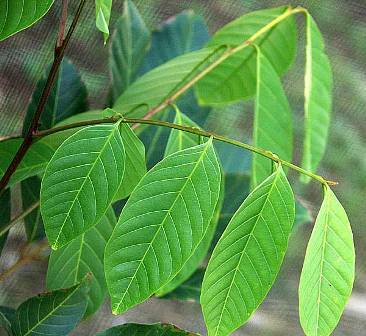 Sometimes due to iron deficiency rambutan seedlings show chlorosis (yellowing of leaves) which should be corrected immediately by appropriate soil amendments. The modified forkert (modified patch budding) using mature budwood, and approach grafting or enarching are the standard techniques used in propagation. It is also clonally multiplied through air layering in India, Malaysia and Indonesia. Generally a spacing of 10m between trees is recommended, but this can be modified depending on soil fertility and growth habit of the cultivar. 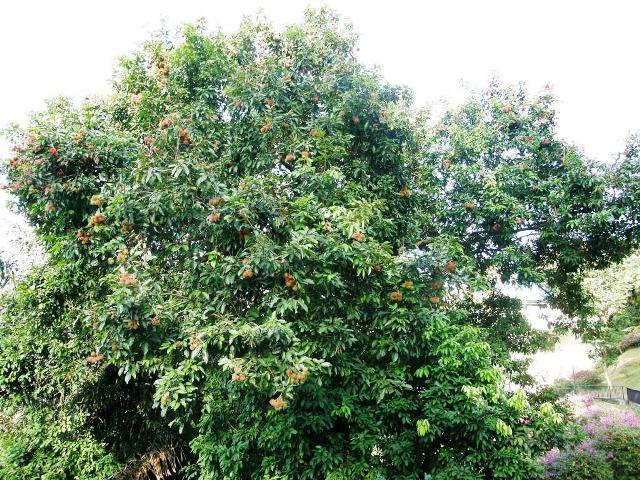 An ideal rambutan tree should have a wide crown with the main branches well separated, and the interior should be free from dead, diseased, broken branches and suckers. Like litchi, rambutan produces its near the periphery of the crown, hence one should go for minimum pruning. In case of insufficient rains or long gap, trees may be irrigated either by canals or by drip depending upon feasibility and the available facility. Long dry season induces flower drop. A general fertilizer schedule is given for the rambutan culture in Table 1. Vegetatively propagated trees have shorter juvenile phase and start bearing when about 4 years old, whereas the seedlings take 6-7 years. Fruits require 4-5 months to develop and reach harvestable stage. In southern Asia, fruits are harvested during July-September and December-February, July-September being the main season. All the fruits in a cluster come to harvest at the some time, making it possible to pick the whole cluster. Harvesting is done using secateurs or a long pole with a hook on one end. Damage to the branches while harvesting should be avoided, as these are the sources of next crop. 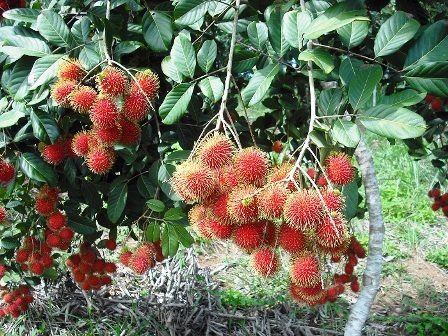 Rambutan trees are quite productive and a yield of about 150 kg/ tree can be expected. But it shows a tendency for alternate bearing. The fruits should be kept under shade. Fruits are graded based on size and degree of ripeness. Then they are washed and dried before packing. Fruits of good quality are selected and packed by placing them in a ventilated box or case of 60 cm x 28 cm x 28cm. The usual juicy aril around the seed is eaten, which can be separated from the seed in case of the free aril varieties. Besides use as fresh fruit, rambutan fruit is also processed to increase added value. Several products like jam, jellies, rambutan cocktail, rambutan sweets and canned rambutan are prepared from its arils but much of the flavour of the fresh fruit is lost. 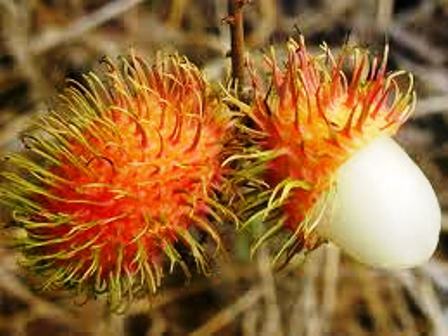 Rambutan sweets are used for pie (as raisin), ice cream and fruit ice. Sometimes arils are canned by stuffing with pine apple in heavy syrup.